I first came to know the English duo, the Ting Tings through their fun tune, ‘Great DJ’, and after discovering that the band were an electropop outfit, I realized there was absolutely no reason not to give the music a try. 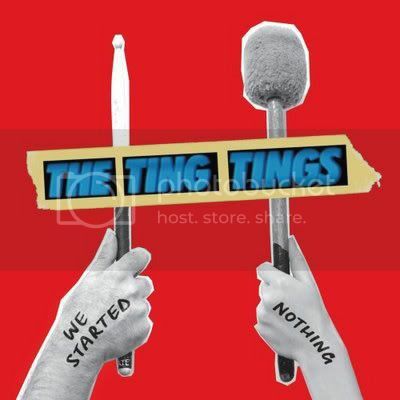 Their debut, We Started Nothing has since met musical audience recently last 16th of May, which unfortunately, carry songs that mostly resembles the trite pop tunes that I prefer to avoid, and quite literally failing to live up to the single fascinating opener track. Having said that, some tunes were bearable enough to sit through, like the child-like, tinkering ditty ‘Traffic Lights’, and essential indie pop number ‘Be the One’, though being rather radical shifts from the typical electropop music you would initially expect to hear, venturing more towards pop, rather than pure electro. The rest of the collection would take after tunes by different artists or other, evidently in ‘That’s Not My Name’, which drew comparisons to Toni Basil’s ‘Mickey’, or worse, Avril Lavigne’s ‘Girlfriend’, as lead singer Katie White assumes a sassy, snarly, punk-girl vocal style, that’s really neither here nor there.